Husband and wife team Ria and Yiouri Augousti use a mix of unconventional fabrics to create the modern vintage style that has become the signature of Augousti. 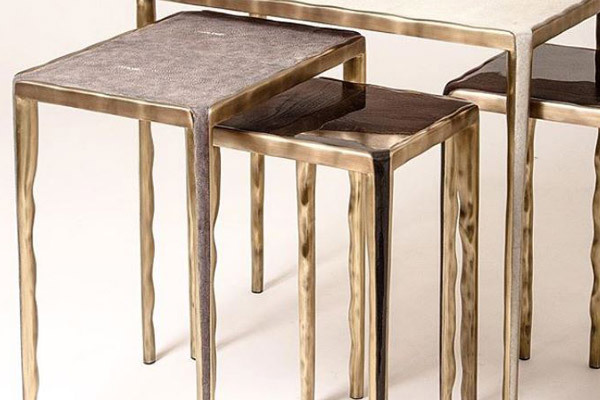 Their main influence comes from the Art Deco period in the 1930’s when parchment (goatskin), shagreen (stingray skin), ostrich, snake, lizard, crocodile and exotic shells were used to make furniture and decorative objects. Ria and Yiouri have now used these exotic materials with other more conventional materials to produce a sophisticated assortment of accessories and furniture.